I've used alcohol inks in the past for card-making, but last week I decided to see what they could do around the house. I used the brand most familiar to card-makers and scrap-bookers: Adirondack Alcohol Inks. Sold in sets of three-color-combos and in singles, the inks, which are to be used on NON-porous surfaces, are acid free, quick drying and transparent. They are also billed as being 'permanent'. I chose the Nature Walk Kit, which includes butterscotch, stream and wild plum. I decided to try them on metal, ceramic tile and glass. A few things to know before we get started: They make special applicator and pads for this ink. You don't need them. Rubber gloves will protect your hands from the ink and as for the pads, just cut a chunk of cheap felt into 2" squares and you're good to go. Also, make sure the objects you're working with are clean. Now, let's start, shall we? First, an embossed bit of aluminum. I started with a few drops butterscotch on a square of felt and then dabbed it over the surface. When working with this stuff, it's best to start with the lightest color in your palette first. and then, finally, the stream color. Not bad. Next was the tile. Here it is with all three colors applied. And lastly, a glass votive candle holder. Now, what about that 'permanent' claim? Well, it's not. At least, not on its own. For decorative uses, like for artwork, it's fine. It's perfect, actually. But if you're going to USE the object, then no. It's not permanent. To test the durability of my surfaces, I let them cure for about 48 hours and then I used my fingernail on 'em. The paint scratched off all the surfaces. I also found out that a vigorous rub with a wet paper towel will take it off too. According to Adirondack's FAQ's, if the objects will be 'handled frequently' you'll need to seal them with a water-based and waterproof sealer like Modge Podge. In all, these inks are a lot of fun to work with, and, as you can see, they're very versatile too. For another before and after pic as well as a lesson in hand protection, check out this post on diymaven.com. 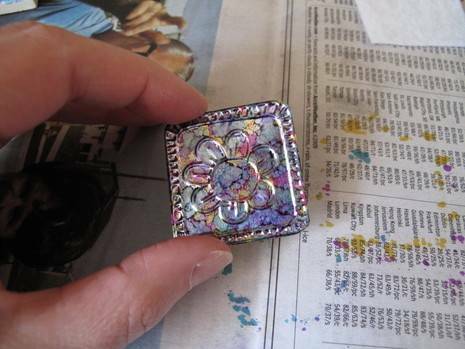 How did you apply the Modge Podge without rubbing off the color ? I like your thinking and art.